Bolkenia is a small, peaceful region of gently rolling farmlands and serene, tranquil countryside. Farmers, merchants, and tradesmen work hard to make this region prosper. It also has a modest, but thriving fishing industry. With a powerful river to the west and a convenient seaside harbor to the east, it makes a logical economic way point. It was once nestled snugly between the two large cities of Eno and Irombro, making it a heavily used region for travel between them. Once the city of Eno fell into the sea, the region saw a large influx in refugees from the city. As time past the area grew less important than it once was. Trade diminished with the loss of Eno and it has yet to reach the prosperity of yesteryear. 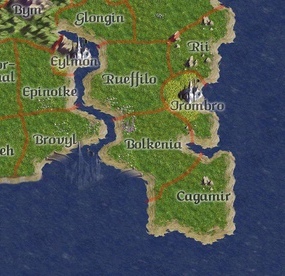 Originally lost by Luz de Bia during the Second Undead Invasion, Riombara proclaimed the region as rightfully theirs, however, following the Secession of Irombro, it joined Irombro and Rii in forming the realm of Irombrozia. Since Bolkenia is the Riombara border Eno, the Undead City, and the rest of Riombara, Bolkenia's Count made sure that there was a strong militia presense there. With it's 40 men guard unit, the villagers sleep peacefully and dream of the occasional festival held in Irombro, which is only 4 hours away. As the population of Bolkenia grows, its importance within the social structure of Riombara will grow as well. During the Luzian War of Aggression, Bolkenia was taken for roughly a week, but when Irombro seceded, Bolkenia followed due to it's strong loyalty to it's former Duchy. The former Count, (Marc Keithson) used Bolkenia as a springboard to Dukeship of Irombro; and, following the controversy between himself and Prime Minister Delvin, Duke Marc became King Marc. Bolkenia came to be a territory of the Kingdom of Alluran following the start of the Third Invasion. After the secession of Eno under Duchess Belinde, Bolkenia followed its duchy to the Dominion of Alluran. As Obia'Syela expanded and took control of the area, the Heralds of Obeah became a prominent influence in the region. With almost everyone worshiping Obeah the need for shrines and temples is growing. On the 18th of January in 2019, a shrine to Obeah was erected in the center of the region. At the cross roads between Rueffilo and Irombro, the Lord Herald Eva Foote commissioned the shrine. A small inscription at the base paid homage to the most prominent noble in the region, Dame Mariana le Craint. This page was last modified on 18 January 2019, at 11:48.